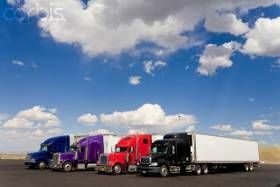 If your gonna give up that easy on a test by all means plz save yourself the trouble of getting your cdl. You wouldnt make it out here a week! This job is tuff and has repetitive issues each with different results. If you cant take the frustration on a test you dont have what it takes to make it in the trucking world. Sorry Brett delete this if you want but its true. And keith the lever is a trolly break and the parking break is a knob 2 totally different breaks which is why you are getting it wrong. The question isnt wrong you are! I was already out there for 22 years and survived just fine !! Keith, I think after thinking further about this you are simply not understanding the question. You seem to be a little short on patience and that is probably what's causing your snag. The questions are sometimes worded in such a way that you have to read them carefully. The very simple reason they are done this way is because that is exactly how they are often times in the actual state exams. They want to see if you are paying attention and understand the little nuances about the rules. If you just race through the question and don't really understand what it is asking you for then you are doomed to answer it incorrectly, you may even be able to quote the answer you gave from the manual, but if that's not what the question is asking you for then you still haven't gotten the answer correct. Now, we have occasionally had someone find a mistake in the system and we are thankful for them pointing it out to us. If you would be so kind as to quote the question that is snagging you up Brett would be able to determine what's happening here and maybe help you move forward. So if you could do that for us we would appreciate it greatly. Ok, everybody keeps saying this program is the best there is, I vehemently disagree!! I flat refuse to "learn" faulty information..
Hey Niki. To be honest, I'm not sure what your question is. Can you clarify please? And I don't know what that means either but it sounds a bit scary. Hi Ryan, I think most of the bigger companies have regional operations, your willingness to relocate could be an advantage finding a good fit so I would think you're headed the right direction, Good luck to you. I feel out of the loop on the BMI , sleep apnea thing... I thought I was ok when they didn't push the BMI restrictions thru(i would've been in trouble with that, don't know what my BMI is but I know it's BAD) I heard recently that some companies are requiring drivers to have sleep studies done(at the driver's expense)in order to keep their jobs, that has me kinda worried,I think i remember seeing something about probable apnea(maybe just because I was such a fat slob)in my records when I got out of the hospital after my stroke but I don't remember them doing any testing. Thanx guys, I've heard a lot of drivers talk about their DAC over the years, so I was expecting something much more involved than what I got. I haven't changed jobs since 1996 or had an accident/incident for more 10 years, and I never failed a drug screen so I guess I should be happy it's blank instead of surprised by it. You're halted because you're still struggling with the question. If you're 3 of 5 for the question that means you don't understand it. Keep doing it and keep answering it correctly and the halt will go away. But so far, you've still answered the question wrong too many times to continue and be given new study material. Also, it's pretty easy to find out which question you keep getting wrong. It's the one that pops up on every test. ....when both tires on the right rear axle on my trailer blew at 60 MPH westbound on I-24 in TN this morning. The 4-wheeler who was hanging out in the lane next to me was, but that's his problem. He shouldn't be hanging out there. I sure did get scared when I saw how many so-called "professional" truck drivers made absolutely no effort to slow down and move to the left when I was sitting there waiting for the Loves service truck to arrive. And I was downright terrified after he arrived and started unloading stuff off his truck. I was almost sure he was gonna get splattered before he was done with the job. Now I expect stupidity from 4-wheelers. Those who aren't on the cell phone while they're cruising along at 65-75 MPH have such a bad case of rectal cranial inversion they don't even see what's going on until it's too late. When they do see the pretty orange triangles 10, 100, and 200 feet behind my truck, they probably figure it's leftover Christmas decorations. The flashing red lights on my truck and the yellow ones on the service truck mean there's a clearance sale at K-Mart, right? But I expect better from my road brothers and sisters. I know you all know exactly what is going on and what can happen. Is it really going to cost you that much to slow down and move over? Is that half a penny you may lose really more important to you than my life? Or the life of that young man from Loves who is making peanuts to change the tires on my trailer and has a young wife and a 3 year old waiting for him to come home from work tonight? Really? Think about this: it may be YOU out there with blown tires next week, next month, or next year. How would YOU like it? Now back to your regularly scheduled programming. Rant over. Okm this really getting ridiculous, i clicked the link for the questions, one of the short quizes popped up , i answered the question s got the "yeehaw you you're the greatest thing since sliced bread you got 100%" message and then the "you got halted" how can i get halted if i didn't miss any ? I understand the concept behind the"halt" on the online study course but what good does it do to say"you have been halted because you are x for x on question number whatever, please don't guess we can read your mind and know that you are not learning anything from this program" when the questions are not numbered. Sure, that's fine. I could have just changed your old one in the system if you had scores from the training program or wanted to keep your history from this forum - things like that. But either way is just fine.